20 Baht type 1 pink offset at the middle, double outline alphabet watermark, serial number run from C1 00001. 20 Baht type 2 change pink offset area to pink microtext "TWENTY TICALS", serial number run from C2 00001. 20 Baht type 3 change the color from pink to green, serial number run from C2 36001. The notes that run from C2 53000 were change alphabet watermark from double outline to single line. 20 Baht type 4 add serial numbers under signatures and change alphabet watermark from double outline to single line, serial number run from C3 75001. Type 1 ordinary number signatures Mahisorn-Rachanee VF about 378,000 - 396,000 baht. Type 4 ordinary number signatures Kittiya-Manas F about 29,500 - 31,000 baht. Type 4 ordinary number signatures Kittiya-Chaiyos VF about 66,000 - 69,000 baht. Type 4 ordinary number signatures Supayok-Thep VF about 59,000 - 62,000 baht. The price was updated on 29th December 2017. The 20 Baht 1st series Thai banknotes were produced by Thomas de la Rue and printed only one side with flat ink as called uniface banknote. There were 4 types with little adjustment in details. The main appearance of notes were like boxing stage plan, the denomination value were on the four corners in Thai and Arabic. There were Chinese words on the left and Malay on the right. The Royal Coat of Arms were in the middle top above Thai words "The Siam government promise to pay the money to the holder in Siamese currency". The image of three-headed elephant watermark located at the middle which surrounded by the watermarks of the Government of Siam and the denomination indicated in both Thai and Roman. 20 Baht type 1 banknotes were announced on 7th September 1902. 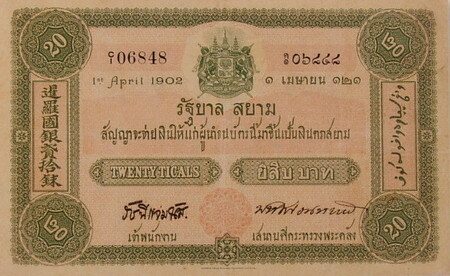 20 Baht type 2 banknotes were announced on 16th January 1904. 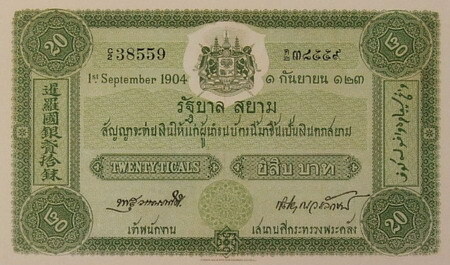 20 Baht type 3 banknotes were announced on 18th January 1908. 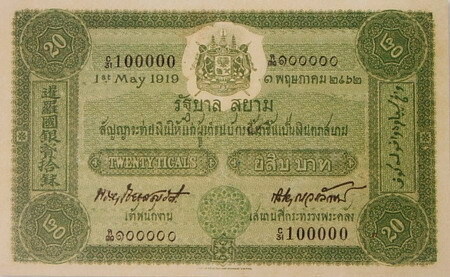 20 Baht type 4 banknotes were announced on 12th December 1910. Type 1 starts from C1 00001. Type 2 starts from C2 00001. Type 3 starts from C2 36001. Type 4 starts from C3 75001.